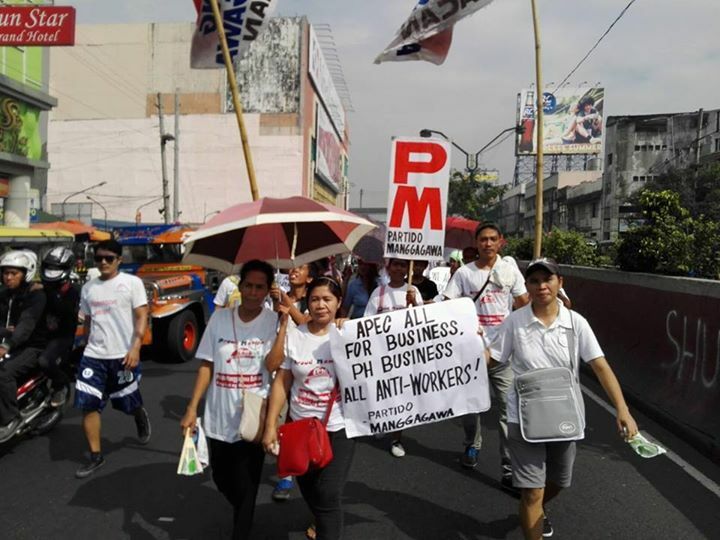 In a multisectoral rally today in Manila, the labor party-list group Partido Manggagawa (PM) decried the Asia Pacific Economic Cooperation (APEC) summit for its “pro-business, anti-labor record.” Several hundred members of PM and other sectoral groups coalesced under the People’s Forum on APEC marched from UST to Liwasang Bonifacio in this major anti-APEC protest. As of the moment, police have blocked the mobilization in front of the Metropolitan Theater. 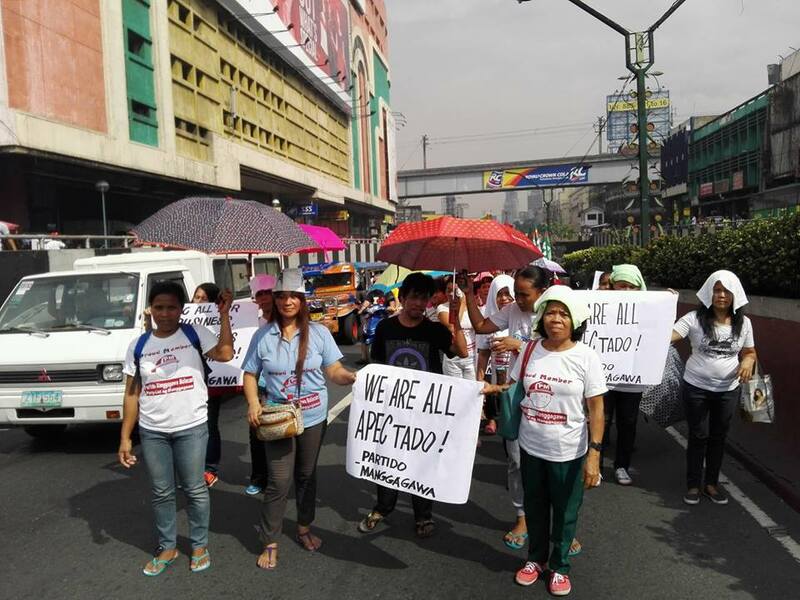 Workers from two Korean-owned companies based in the country who are now embroiled in labor rows are challenging the leaders of the countries on APEC’s track record on workers’ rights. Employees of power company KEPCO-Cebu and metal factory Tae Sung in Cavite have charged their managements with union busting and have pending labor disputes. According to Charlie Piamonte, union president of Tae Sung Employees Association (TEA), they filed a notice of strike last November 12 for union busting. He explained that Tae Sung illegally fired union officer Joven Niviar, among other incidents of harassment of union members. The union is planning to conduct a strike vote within the next few days. Under the law, a union may launch a strike seven days after a majority of union members authorize it through a vote. Tae Sung is based in the Cavite Economic Zone in Rosario, Cavite and produces metal parts for the supply chain of multinational companies like American Power Conversion-Schneider Electric, Honda, Mitsubishi, Caterpillar and Siemens. Meanwhile, Lowell Sanchez, president of the KEPCO Cebu Supervisors Association (KCSA-WSN-Sentro), challenged the government to resolve the long-running labor row that is now the subject of an assumption of jurisdiction (AJ) order from Labor Secretary Rosalinda Baldoz. The KEPCO union filed a notice of strike last June for the unfair dismissal of Sanchez. The planned strike of the KEPCO workers was stopped by an AJ order so that it will not affect the APEC ministers meeting in Cebu last August. KEPCO is South Korea’s state-owned power company and operates coal plants in Cebu and Batangas. “KEPCO and Tae Sung are crystal clear examples of how APEC has facilitated growth and profit for multinational corporations that operates across borders. And they also fully illustrate how workers have born the sacrifices for the phenomenal economic benefits that corporations have reaped due to APEC. 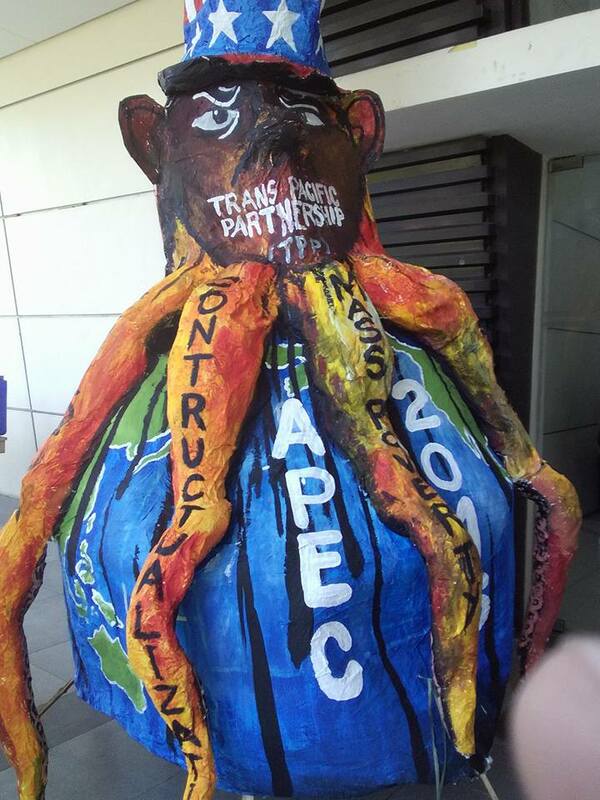 Workers across APEC countries contend with low pay, contractual work and union suppression even as their labor created the doubling of real GDP within APEC between 1989 and 2013,” Magtubo averred.